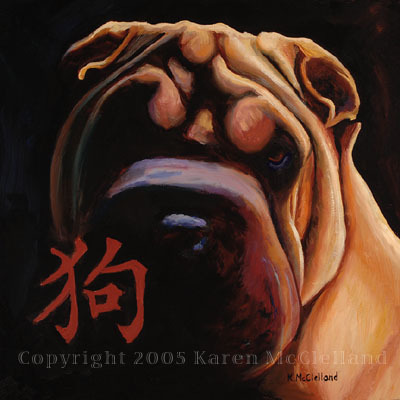 Shar Pei limited edition giclee art print, dog painting done by artist Karen McClelland titled "Chinese Dog"
Shar-Pei dog print titled "Chinese Dog"
I love dramatic lighting. The Shar Pei with all his wonderful wrinkles made an excellent model for playing with lighting. The left hand symbol is the Chinese character for "dog".Other Shar-Pei print. 12" x 12" or 16" x 16"